The new two-in-one product smoothes, protects and conditions skin while correcting surface irregularities and creating a luminous finish. The primer may be worn on its own, like makeup, or as a first step to extend the coverage and wearability of concealer and foundation. Natural earth minerals blend away discolouration and enhance luminosity, while polymers prime the surface with a soft, matte effect. Dermalogica’s AGE smart SkinPerfect Primer SPF30 addresses the underlying causes of skin aging. The potent mix of antioxidant White Tea, Peptides and Sodium Hyaluronate protect skin from further damage, while stimulating collagen replenishment and helping to hydrate skin. Physical sunscreens provide an SPF30 in the form of Zinc Oxide and Titanium Dioxide that shield skin from the primary cause of extrinsic aging, UV exposure. When it comes to beauty brands, Dermalogica ranks as one of my favourites! So when I received the Skin Perfect Primer…expectations were high. This primer is amazing (and I am not being biased at all). It has a silky smooth/velvet texture and only a small amount is needed to cover the whole face. At times my foundation can be heavy and thick and sets into fine lines which makes my make-up feel one dimensional. With the use of the Dermalogica Skin Perfect Primer I was able to use less than half the normal amount of foundation and achieve a perfect finish. It is great to use during the summer months as the primer keeps the make-up in place – this primer will also protect your skin when out in the sun as it is a SPF 30. A great product! 10 out of 10 from this reviewer! 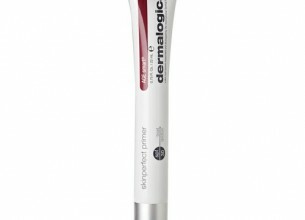 This is another winner from Dermalogica, but isn’t in my opinion the perfect primer. If it cost half of what it does I would be A for AWAY! The product really is silky smooth and creates a nice foundation for make-up with long lasting effects. The only criticism I have of the product is the colouring. It is a pinky toned mousse which doesn’t suite all skin tones (I have more yellow undertones and I find it looks wrong on me if worn alone). It also has a significant shimmer (almost glitter) which may look unnatural in daylight. Hi Moodley. Primers are formulated to improve the staying power of liquid foundation. That being said, even if you only use a powder, a primer will smooth out the skin tone and provide a perfect canvas for your powder. Can you use a primer on your skin if you do not use foundation. I hate foundation but I do use powder. This review is really great. Sounds like a fantastic product. Yes it is very expensive – but what an amazing product! You can’t go wrong with this primer. This looks so promising, I would love to try it, but it’s way to pricy!